Knot books are great learning aids. You sit in your easy chair with some rope in your hand and amaze yourself with handy and useful knots you need to know. You even commit several knots to memory. Six months later you find yourself trying to tie down a kayak in the back of your truck or on your car roof and wind up using the "Cluster Knot" - about eight granny knots on top of each other! Enter the "Knot Card", smartly stashed in your glove box. With a quick peek at the little plastic cards, you are now confidently cinching down your cargo with a series of Bowlines and Trucker's Hitches like a pro! That is the idea behind the knot cards - having them handy when you need them. #1 Best Selling fishing knot "book" on Amazon.com! #1 Best Selling fishing knot reference in USA! Don't ever forget how to tie that knot again! 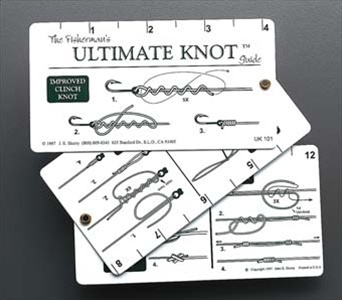 This 3 card set fits easily in a shirt pocket or tackle box and also folds out to a 12" ruler. Waterproof plastic cards feature clear illustrations of 10 most popular knots: Improved Clinch, Palomar Knot, Uni Knot, Surgeon's Knot, Double Uni Knot, Perfection Loop, Dropper Loop, Surgeon's End Loop. Nail Knot and Blood Knot.